There are lots of things that could potentially change cloud cover, which would affect our climate. Things like cosmic rays (see page 18), changes in patterns of ocean temperature, land clearing, or aerosols all affect clouds. Evaporation and rain keep the planet 50°C cooler. Fifty! Eighty percent of the natural greenhouse effect is due to humidity and clouds. Clouds cover 60% or so of the entire planet. No one has any idea whether cloud cover was the same in 1200, or 1800, or even 1950. It’s a guess. The IPCC and the modellers admit they don’t do clouds or rain well. 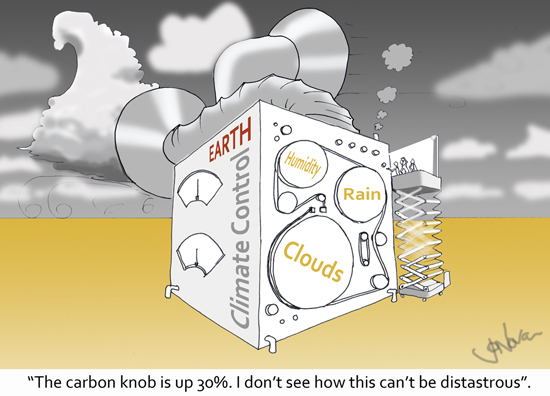 But these factors are the master “knobs” on Earths’ climate control unit. If the computer simulations are only out by a few percent, any tiny change in evaporation, clouds or rain will wipe out the warming from carbon and it can do it in days. The climate models rely on best guesses, assumptions and estimates. The models are incredibly accurate on dozens of points that don’t really matter, but they stab in the dark at the one or two points that do. Source: 50°C cooler, “Water Cycle” NASA Science. This is Page 7 of The Skeptics Handbook II, a 20 page PDF. This post fits especially well with the page on Feedbacks since one of the most powerful factors amplifying or dampening any effect of carbon are clouds. Great to see logical, factual and scientific science being presented instead of hearing the same old hog wash in the MSM from those stuffing their snouts in the trough at Copenhagen! How do you get from CO2 as trace gas to ruling all, that is a feat. No one ever explains that. While pollution can do that, cause widespread and dominate harm, think nuclear fallout and the Van Allen Radiation Belts, pollution is bad — I see a lot of reports that CO2 is a pollutant — which it is not. Atmospheric CO2 is necessary for life on earth. Isn’t water vapor responsible for 95% of the earth’s greenhouse gases? And why isn’t the missing CO2 greenhouse hotspot, Al Gore’s blanket the end of the argument? Isn’t that how you take down a hypothesis, with empirical proof of it’s falsity. Pretty Much what Dr Spencer is trying to get the modelers to appreciate. There’s a correlation between cloud cover and warming so, as I understand it, the modelers have assumed that the warming (forcing) has caused the change in cloud cover (feedback). Dr Spencer proposes that it’s the other way around. i.e. that the warming is a feedback to the change in cloud cover. The first process would give a high climate sensitivity the second would give a low sensitivity yet they appear almost indistinguishable. He thinks that is why it’s been easy for modelers to assume the first process. How do you get from CO2 as trace gas to ruling all, that is a feat. That is something that really is an astounding leap of logic to me as well. At 400ppm (0.04%) you just have to suspend all credulity in order to think that something in such a low concentration can be that critical. If that 0.04% was not dispersed through the atmosphere, but somehow congregated (like UN bureaucrats, government officials and climate scientists) in one place then I could see how it could have a significant effect. But CO2 is dispersed throughout the atmosphere and the air is homogenised (rather like meteorological data). It should be just common sense that clouds have a major effect on the weather and climate. On cloudy days it is significantly cooler, and on cloud free days it is significantly warmer. In one of the CRU emails, a scientist says that faking up [temperature] data here is very time consuming. Well, I know what you are thinking – it is just a quote taken out of context – even suspecting the possibility of any untoward behaviour by a climate scientist reveals my obvious biased political viewpoint. Faking up data is obviously just standard scientific behaviour. Nothing to see here, then, just move along. This is interesting. Svensmark and Calder produced a very readable book on a closely related subject a couple of years ago. Svensmark still pursues related basic science as opposed to stuffing wobbly data into a computer. The rub is that Svensmark is based in Copenhagen…wonder if Kev the Great will deign to pay Henrik a visit? Dr. Maciej Nowicki , past president of COP14, who made the opening speech of the COP15 conference in Copenhagen has just resigned (i.e. just been sacked) as environment minister by the Polish Government, who now apparently believe that global warming is a hoax. Poland is heavily dependent on coal for its economy. I agree it should be just common sense that clouds have a major impact on the weather and climate. But it is not always cooler on cloudy days nor is it always warmer on cloud-free days. Think about winter. It is usually warmer on cloudy days and nights, and colder on cloudless days and nights during winter because the effect of the clouds trapping the heat close to the earth more than offsets any loss of the warming effect from the weak winter sun. Which just goes to show that the net impact of some very basic things that affect the weather and the climate, like clouds, can sometimes be positive and sometimes negative, depending on other factors — and those other factors don’t include carbon. This lovely piece uses disarmingly simple logic to effectively deconstruct the warmist arguments of the global warming “faithful”. So is the US, Australia, China… What is the point of including this?? This model has an atmospheric model sub sytem called CAM3. I believe the CAM3 allows cloud parametrization as described in Section 4.7 under http://www.ccsm.ucar.edu/models/atm-cam/docs/description/ and Table 2.6 in section 2.5 under http://www.ccsm.ucar.edu/models/atm-cam/docs/usersguide/. I’m not a climate scientist but I would be very interested to see if it’s possible to parametrize this model’s cloud behavior (realistically) such that the model showed low climate sensitivity. My reasoning is this. If we can show, using one of the IPCC’s climate models, that a doubling of CO2 only leads to around 0.5C then they would have to change their projection range from 1.5 to 4.5 to 0.5 to 4.5. Hence they would need to conclude the possibility that the climate may have negative feedbacks due to clouds. As far as I can tell cloud parametrization is the main determinant, in the models, on resultant climate sensitivity. So the IPCC would need to show why the parameterization that gave 0.5C was wrong. i.e. they would need to falsify the low climate sensitivity of 0.5C. Cloudy don’t really act as insulation. Cloudy nights are warm because atmospheric water vapour condenses after sunset and releases vast amounts of latent heat. This condensation effect is also why it rains so heavily at night in the tropics. Desert nights are cold because of a lack of humidity. This means that very little latent heat is released by condensation. Cloudy days may seem warmer because of high humidity. However extensive cloud limits maximum temperatures to around 33C – this is the typical summer temperature in cloudy Darwin or Cairns. In fact Darwin is sometimes hotter during the “cooler” dry season than in summer. Cloudless desert regions on the same latitude can exceed 50C. Bloggers can someone help me with the following please, I’ve been scratching my head so much I’ve developed a bald patch. Have I been up too late? Does this mean what I think it does? I go to a financial consultant, after lecturing me for an hour that I’m going bankrupt, he tells me that I have to cut back my CO2TS (costs) back to 2000 levels. I ask OK so if I do that, where will my financial position be in the future? So the collective brains of the world are meeting for the 15th time now, hammering out how much emissions to cut, how many billions it will cost BUT NONE OF THE #@%&ERS KNOW WHAT RESULTS THAT WILL ACHIEVE???? Somebody please tell me I’ve been up too late and have misunderstood this final paragraph. Joanne, this is an excellent post! Keep an eye on your link to NASA oceans and water cycles, for the following reason. So far, we have the climate realist Roy Spencer and Gaia-hugging NASA oceans in complete agreement. Aerosols appear poorly understood. IPCC says they are cooling. A recent paper says they are not as cooling as IPCC thought. But aerosols help cloud formation, which could be even more cooling. What if natural “dirty” combustion causes its own built-in cooling effect? …and co-called “clean” nuclear does not? ..and Nordell is right about thermal pollution causing warming? More research and less dogma p-l-e-a-s-e.
“My reasoning is this. If we can show, using one of the IPCC’s climate models, that a doubling of CO2 only leads to around 0.5C then they would have to change their projection range from 1.5 to 4.5 to 0.5 to 4.5. Hence they would need to conclude the possibility that the climate may have negative feedbacks due to clouds. Good post Steve – you are indeed thinking very clearly! FYI, on the WUWT page there is an excellent .pdf of Roy’s presentation you can download and read at leisure. Well worth it. “Andrew Lacis, who works climate modeling with Jim Hansen, came up and said he agreed with me that, in general, the feedback problem is more difficult than people have been assuming. In a talk after mine, Graeme Stephens gave me a backhanded compliment when he agreed with at least my basic message that the way in which we assume the climate system functions (in my terms, what-causes-what to happen) IS important to how we then deduce how sensitive the climate is to such things as our carbon dioxide emissions. In other words, the models may well be misinterpreting the direction of cause and effect between clouds and temperature. As Chris also noted (thanks Chris) cracks in the NASA models are appearing. “It was standing room only…close to 300 scientists by my estimate. There were only a couple of objections to my presentation…rather weak ones. Afterward I had a number of people comment favorably about the ‘different’ way I was looking at the problem. That, ladies and gentlemen, is the bottom line. Do not pass up plane pollution as a major player in the chain of events..call the pollution what you like it is still pollution….